Ibrahim Shahid, a student of Beaconhouse School System, Boys Branch, Margallah Campus has stunned the world by scoring 23 A’s in Cambridge O Level exams to set a new world record in the history, reported Express Tribune today. Story was produced on Express 24×7 and Geo News as well. Paper and TV said that Ibrahim Shahid sat for 24 subjects and scored 23 A’s . Ibrahim Shahid attributed his success to his parents and teachers, said Express Tribune. Ibrahim Shahid recalled an incident where his teacher in Australia had written him off, stating that he would “never excel”. 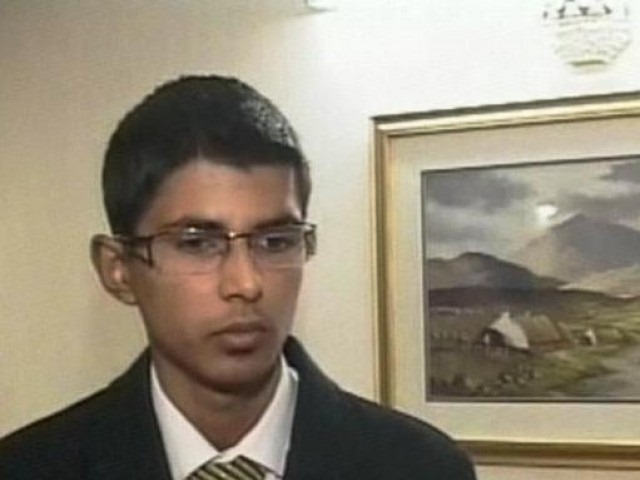 Earlier, Ali Moeen Nawazish, also a Pakistani student, had set a world record by securing 23 As in A level Cambridge exams. but I read that it was 18 A’s not 23 . If that’s easy why is the first time anyone did it? If it’s that easy why don’t you do it too? I and all Pakistan will be happy to see you achieve this “Easy” objective. YOU SIMPLY LACK THE COURAGE MAN! YOU HAVE MADE A STANDARD OV YOURSELVES TO COMPETE WITH OTHERS! KUNWAY K MAINDAK KI TRHA! KUNWAY SE NIKLO AUR BAHR DAIKHO! HE HAS SIMPLY DONE A GREAT JOB! ahsan i would say look what you are saying, you took 90% in just 9 subjects and even then you are not even sprinkled at national or divisional level of pakistan. He took 15 more subject than you and he break the record all over the world. who knows you there many of you people stand in the ground. but this is the only ONE who stood in the whole of to raise our flag of Pakistan. dear i am not discouraging you but i am discouraging your thoughts which will give you nothing but the depriveness. i hope your got my point. 1stly can you prove that you got 9 A’s ? And His age is just 17 . And As far as I know he did it in three years . Just lyk You got 9 A’s in 3 yrs ! or you got all of them in one yr ? And surely grades don’t say much but these are not just grades it’s his achievement that shows his passion and commitment . prove? lol ok add me at [email protected] ill share you a pic of my results i gave my o level’s when i was just about to be 15 and now when i am about to be 17 ill be giving my a level this june . and just so that i may know . who the heck does o level in 3 freakin years? Jnab pic don’t say’s anything . Can you share your marksheet\result ? And O level is done in minimum two or 3 yrs . You can start ur O level after 8th class i.e usually at the age of 14 or 15 ! and 2 to 3 further years will be taken for the completion of O level . How can you do all that just at the age of 15 ? And in My city Sialkot all the schools e.g BSS(Beaconhouse) TCS( City skool) APC(Army public college)and my own school CSS(Classic School System)offers O level in three years only . And do you even know what O level means ? This is remarkable! What were the subjects? Wasay apna koi Pakistani bhai kuch acha krta hai to apni promotion sy zaida khushi hoti hai..
Great My Brother! Insha Allah we’ll be in developing countries in near future. Congrats Ibrhaim. Well done. Keep it up. C’mon till how long you will satisfy yourselves by saying things lyk dis that he is rich and thats why he was able to do this and you can’t do dis ? Brother 3 years back Lahore board me F.Sc me 2nd position lene wala larka part tym rickshaw driver tha . And for your kind info F.Sc is tougher then O level . Agar ek itna gareeb bnda jo ghar ka kharcha chalane keliye Rickshaw chalata tha wo Board me position le skta hy to kya aap Ibraheem ka record nai torr skte ? shaani get riched from your thoughts if you can’t be riched from pocket. Imran good advice for your own self. YEAH ITS ALL FRAUD BECAUSE IT IS NOT POSSIBLE TO GET SO MANY A’S. THERE IS SOMETHING WRONG WITH THIS. very good, cavemen you don’t want us to go ahead. Well done Mr Ibrahim Shahid. All Pakistanis are proud of YOU. Congrats man… we are all proud of you….. I completely not bothered about his grades. he is boring. i hope i break your world record!!! Congratulations for your Brilliant result. Nice to meet you.Wish,you will carry on your progress.Best of luck.